This thing has a lot of function and simple to use. just long press the power button to turn it on and off. The material is pretty flexible and my partner likes it. Good buy, better than what you'd find at a local store. Good deal, but a note to the seller, it would be nice if you could control the the two motors individually. 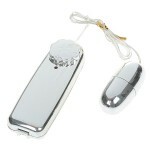 I like that it is very easy to use and it has a rechargeable battery which is very nice. I like that it doesn't hurt my hand to use. This is a great product when your looking for something different. So many different speeds not just the normal fast/slow. Bendable for comfort settings. Very satisfied with this product!